It has come to my attention that there is a rise in the trend of "Faith jewelry." I've seen an influx of crosses, ohms, and hamsas or hands of G-d, often using the rosary style beads. 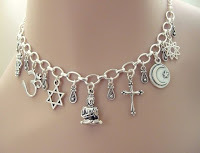 I have also seen people wearing these symbols of faith across religious lines. I think this is a wonderful thing. In these tough times it is important that we have something to turn to. Why not incorporate these things into our wardrobe as a constant reminder that we have faith AND that we look FABULOUS? "I support all efforts to share spirituality and faith in a tolerant way...no matter what religion!" I am very inspired by this trend and with the holidays coming up it is more prudent than ever. Keep an eye out for some faith based pieces from mulryjewels in the future. As always, you can check me out at www.mulryjewels.etsy.com . Thanks, and Keep the faith!